Yum! 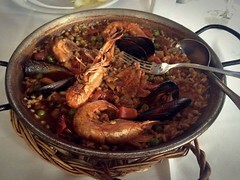 The above dish is the famous spanish dish called Seafood Paella. It’s a rice dish, mixed with fresh seafood, vegetables and seasoning. It’s one of my favorite dishes in Spain! It’s really easy to get here. You can start from La Rambla, walk all the way to the end of the street and then head west. There you will see a lot of restaurants along the beach. 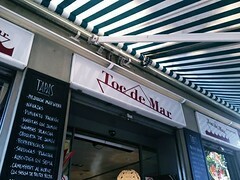 Toc De Mar is just along the way. This was a nice little restaurant with a patio. Since it was a gorgeous day I opted to sit outside. Now I am no food expert, but the food here definitely was very fresh. And oh the atmosphere, what can I say? You are in Barcelona! Of course the atmosphere is amazing! If you want a wider range of reviews, do visit Trip Advisor. The reviews do range from poor to excellent, me personally siding with the excellent side but then different people, different expectations, different tastes right?